Summer fun around Sanford, NC can quickly turn into a swat-fest when buzzing, biting mosquitoes attack. Learn the basics about these bloodsucking insects to prepare yourself for summers’ annual battle. Only the female mosquitoes bite, using a long, hollow, needle-like mouthpart that pierces a capillary. Females need the protein from blood to produce fertile eggs. She can lay eggs up to 3 times before she dies and each batch of up to 300 eggs requires one blood meal. And they can detect carbon dioxide (CO2) from 75 feet away! They will fly back and forth until they find the source, which becomes their meal. But, they can also get attracted by body heat, sweat and skin odors. 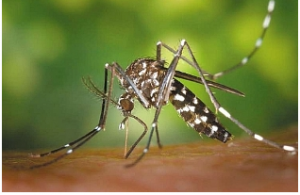 Some agencies rank the mosquitoes as the deadliest animal on earth because they can carry and transmit several deadly diseases, including Malaria, Yellow Fever, Dengue Fever and Encephalitis. They also carry West Nile Virus and canine heartworm. Mosquitoes need water to complete their life cycle and they can breed in almost any source of water. Some lay their eggs individually or in “rafts” on the surface of the water in swamps and flood water areas. These eggs will hatch within 24-48 hours depending on water temperature. Other mosquitoes deposit their eggs on tree holes, discarded containers or depressions in the ground that will hold water. These eggs survive over the winter or more than a year. Contacts us today for your Mosquito control estimate Today.